Writing under the pseudonym Ellen Douglas, Josephine Ayres Haxton has published numerous short stories and novels set in a fictional Mississippi county, Homochito County. Josephine Ayres was born July 12, 1921, in Natchez, Mississippi, and grew up in Louisiana and Arkansas. She attended Randolph Macon Women's College from 1938-39 and the University of Mississippi, from which she earned a B.A. in 1942. In 1945 she married Kenneth Haxton, with whom she had three children: Richard, Ayres, and Brooks. She died Nov. 7, 2012, at the age of 91. 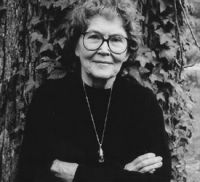 Her fiction, published under the pen name Ellen Douglas, includes two collections of short stories  Black Cloud, White Cloud: Two Novellas and Two Stories (1963) and The Magic Carpet (1987)  and six novels. Her first novel, A Family's Affairs (1962) was named one of the ten best fiction titles of the year by The New York Times, as was Black Cloud, White Cloud. In 1968 she published Where the Dreams Cross, and in 1973 she published Apostles of Light, which was nominated for a National Book Award. She received Mississippi Institute of Arts and Letters Awards in literature for The Rock Cried Out (1979) and A Lifetime Burning (1982), as well as grants from National Educational Association for The Rock Cried Out and Can't Quit You, Baby (1988). In 1989, she was honored for her body of work by the Fellowship of Southern Writers. Her most recent work is Truth: Four Stories I Am Finally Old Enough to Tell, a nonfiction book based on stories and legends in her own family's history. The Mississippi Arts Commission features Ellen Douglas in a page about narrative in its online exhibit Crossroads of the Heart: Creativity and Tradition in Mississippi. The page features audio of Douglas reading part of her essay "Grant." A Family's Affairs. Boston: Houghton, 1962. Black Cloud, White Cloud: Two Novellas and Two Stories. (Short stories.) Boston: Houghton, 1963. Illustrated by Elizabeth Wolfe. Jackson: University Press of Mississippi,1989. Where the Dreams Cross. Boston: Houghton, 1968. Apostles of Light. New York: Houghton, 1973. With an introduction by Elizabeth Spencer. Jackson: Banner Books, 1994. The Rock Cried Out. New York: Harcourt, 1979. A Lifetime Burning. Boston: Random House, 1982. The Magic Carpet. (Short stories.) Jackson: University Press of Mississippi, 1987. Can't Quit You, Baby. New York: Atheneum, 1988. Truth: Four Stories I Am Finally Old Enough to Tell. Chapel Hill, N.C.: Algonquin Books, 1998. Mississippi Narrative: Ellen Douglas. Presented by the Mississippi Arts Commission. This page has been accessed 5043 times. About this page counter. Last Revised on Monday, November 9, 2015, at 04:35:04 PM CST.